Yet again, there was no winner of the Presteigne St Andrews FC Super Lotto jackpot. 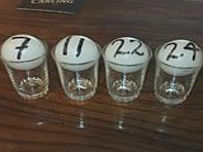 The most recent draw took place at The Farmers Inn on Sunday, 10 February when the four numbers drawn out of the bag were: 4, 9, 16 and 24. Paul Lloyd won the Bonus Buy prize of £20.00 for this week – well done, Paul and that money will be with you soon. So, another rollover – the jackpot now stands at £4,814 for the next draw. This will take place on Sunday, 17 February, again, at The Farmers Inn. So, if you fancy a chance of scooping the loot and taking home lose on five grand, then you need to get hold of a ticket for the Super Lotto in time for this weekend’s draw.